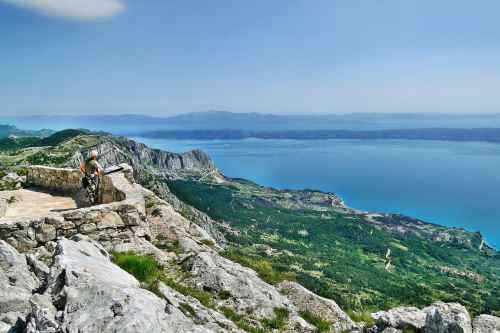 Close to Makarska raises the Dinaric Mountains to a heigth of 1762 meters just five km. from the sea. It is like a wall rising to the sky. It all started 65 million years ago when the sea bed started to raise and since then water and wind have formed the mountains to what they are now. On the top is the Biokova plateau catching rain water and leading it through numerous underground streams into the sea. The Biokova Plateau seems barren, but at a closer inspection it shows to be host to numerous species of plants and animals. Many of them endemic to Biokovo. The most notable animals are wolf, bear and muflon sheep. Even if the area seems inhospitable it has been home to man since the earliest ages. The advantage of it is, that there are always water and grazing for the animals when the low land suffers from high heat and drought during the summer months. Until recently, it was common for the people of the villages along the coast to drive their animal into the mountains during summer and down again in the autumn. Today the area is taken over by mountain climbers and nature lovers. There are many walking trails and a paved road leading up and across the plateau to Sv. Jure. The highest point. The main entrance to the park is before Makarska. When you come from Komarna turn right in Podgora and drive a few km. up to the park entrance. Admission is free and brochures with trails and roads are available here. Please notice that it is strictly forbidden to tamper with the nature at the top. No picking flowers or collecting samples of whatever. The park is in a frail balance, and the park rangers will get quite upset with you if you don't respect that. Croatia holiday home sightseeing and activities from Medjugorje, Mostar and Sarajevo to Dubrovnik, Peljesac and Bosnia-Herzegovina.